Is celebrating birthdays forbidden? Why is it frowned? Isn’t it just simple fun and enjoyment? We only invite friends and have a meal. Aren't we even allowed to celebrate anything? We only exchange gifts! Are exchanging presents improper? We always encounter these types of questions in our day-to-day life. Most of the people argue that neither celebrating ‘birthday’ is mentioned in the Quran nor our Prophet (pbuh) ever expressed anything about? So what is wrong with it? Anyway, the genuine question is why do we celebrate birthdays? And therein lies the real discussion. Since it has now become a custom and everybody is doing it, so we feel socially obliged to follow it. And what do we do on the occasion? Bake a cake, put on candles for every year of the child's age, and blow the candle and make a wish. Are any of these acts un-Islamic? In fact, history of birthday observance can be traced back before the rise of Christianity. In pagan culture, it was believed evil spirits visited people on their birthdays. To protect the person having birthday from the evil effect, people used to surround him and make merry. A lot of noise used to be created in such parties to scare away the evil spirits. Some of the popular Birthday traditions and symbols that we see today originated thousands of years ago. Some believe the tradition of birthday cake was started by early Greeks who used to take round or moon shaped cake to temple of Artemis - the Goddess of Moon. Greeks used to light candles on the cake because of a religious belief that Gods lived in the sky and lighted candles helped to send a signal or prayers to the God. Germans are said to have placed a big candle in the center of the cake to symbolize the light of life. It is believed that blowing out all candles in one breath brings good luck. In ancient Egypt, the pharaohs ordered businesses to close on their birthdays and gave enormous feasts for hundreds of servants. Further, in ancient Greece, wealthy males joined birthday clubs composed exclusively of men who shared their birth date. In Persia, noblemen observed their birthdays by barbecuing an ox, a camel and a donkey and serving hundreds of small cakes to the celebrants. In ancient Rome, the emperor gave huge parties in honor of his own birthday, which included parades, circuses, and gladiatorial combat. But have we ever heard or read if our Prophet (pbuh) or anyone in the Islamic history celebrated their own or their children’s birthdays? It is a well-established fact that neither the Prophet (pbuh) did celebrate his birthday at all during his lifetime nor did he ever order it to be observed. Neither did he ever teach such to his Companions nor did he ever care to practice it. Even the rightly-guided Caliphs and all of his Companions did not celebrate it. They were the most knowledgeable of the people concerning Sunnah and they were the most beloved to the Prophet (pbuh). They were also the keenest upon following whatever the Prophet (pbuh) brought. Thus, if one is supposed to celebrate one’s birthday, this would have been made evident at their time. Similarly, neither anyone of the scholars of the best generations celebrated their birthday nor did they order it to be followed. In present times too, the birthday is celebrated same like before. In fact, the birthday cannot be imagined to be celebrated without cake and candles. Friends and relatives sing the birthday song with the name of the person before blowing out the candles and slicing of the cake. Well, people with good income can afford all such expenditures, but what happens here, is the one whose provisions are strained, borrows money or goes beyond his capacity to throw a grander party than he can afford. In addition, everybody tries in giving or preparing the best gift to his capacity, but the people who cannot afford either hide away from the invitation, do not attend, or go beyond their means in getting this present. Besides all this, Islam does not permit extravagance. It is stated in a Hadith the worst gathering feast is the one in which the poor and deprived are left out and the wealthy are only invited. But in contrast, in these gatherings, music, singing, video filming and other un-Islamic and forbidden acts take place. 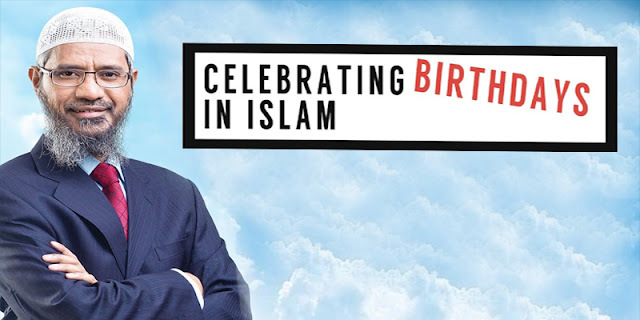 Celebrating birthdays is not a big sin in Islam. The only question to be answered here is who we are following: Allah and His Messenger (pbuh) or the traditions of the non-believers? The need of the hour is to reflect upon the age-old pagan tradition that has been followed and decide if the celebration of birthday fits logically or morally into the scheme of your life. Is birthday something to be happy about? When it is someone's birthday, one year of his/her life has decreased, and not increased. As such, what intelligence is there in celebrating and showing happiness when a year has decreased in one's life? Obviously if we look at the beauty of Islam, every day is a great day and a blessing from Allah…Subhanallah. So celebrate every day and always say Alhamdulillah.